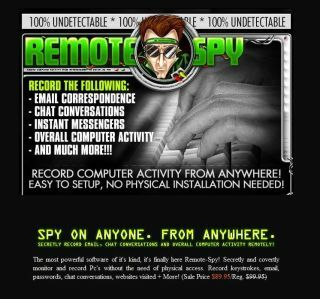 Trojan-based spyware a "threat to safety"
The Electronic Privacy Information Center (EPIC) has filed a complaint (PDF link) with the Federal Trade Commission in the US against a number of websites that trade in amateur spyware. According to EPIC the sites are guilty of “deceptive trade practices” and sell tools that cause “consumer harm”. EPIC calls on the authorities to “further investigate” the companies involved and to “determine the threat to consumer privacy and safety” that they pose. Amateur spyware is usually promoted as an ‘investigative’ tool that allows suspicious husbands/wives to find out whether their partner is cheating on them, or to keep tabs on what their children are viewing online. The various tools claim to be able to record everything from email, AIM and chat conversations to windows activity to individual keystrokes and passwords. Vendors claim that the software that enables this can be sent via email and remotely installed. EPIC claims this is a deliberate ploy to promote email-based Trojans and malware for financial gain without supplying adequate information, thereby exposing users to possible criminal and/or civil charges. EPIC details the activities of five separate internet operations involved in the promotion and selling of amateur spyware products. But it concedes that there are a great many other companies involved in similar practices, suggesting that some companies could well be colluding.